Alex Morgan gave the Pride their first ever lead over the Red Stars, but it wasn’t enough to earn all three points at home as Chicago and Orlando tied 1-1 in front of 5,667 fans at Orlando City Stadium in Orlando, Florida. With the draw, the Red Stars moved to 29 points in the NWSL standings. Though the Courage were able to reclaim to the top spot with a win over Seattle in Saturday night’s other game, the Red Stars moved one point ahead of the Thorns and have sole possession of second place. The draw did not come easy for the Red Stars, who were without Christen Press, Julie Ertz and Casey Short, who competed for the United States at the Tournament of Nations, which concluded Thursday night. Ertz was available as a sub, but did not play in the game. Once again — because it apparently wouldn’t be a Pride vs. Red Stars game in Orlando without it — there was late corner kick drama. But once again the Pride were denied a late goal. In the 87th minute with Orlando trying to find the go-ahead goal, Marta’s corner kick bent in towards the far post, bounced off the ground and up off the post. The rebound bounced around in the box as Jamia Fields and Alanna Kennedy took shots that were blocked. The ball eventually went to Toni Pressley, whose shot appeared to hit Arin Gilliland’s hand in the box, but the handball was not called. Ali Krieger took another shot that was blocked before the Red Stars were finally able to clear it away. Marta did not originally start the game, but came in the 24th minute after Rachel Hill left with what appeared to be ankle injury. Hill went down in the 18th minute, but was able to walk off the field before eventually being subbed out six minutes later. Marta had been competing with Brazil at the Tournament of Nations, but she did not appear in Brazil’s final match of the tournament on Thursday night before starting on the bench on Saturday night for the Pride. The Pride scored almost immediately after Marta entered the game, though she was not involved in the play. Chioma Ubogagu — starting at left back as Steph Catley, who competed for Australia at the Tournament of Nations, was unavailable for the match — sent a long pass up the field to Jasmyne Spencer on the left side of the field. Spencer collected the ball with her back to goal, cut around Red Stars defender Katie Naughton, and passed to Morgan in the box. Morgan kept her stride and hit a left-footed shot that beat Red Stars goalkeeper Alyssa Naeher to the far post. Marta and Morgan nearly combined for a goal in the 39th minute, forcing a big save from Naeher on a Morgan shot that would’ve doubled the Pride’s lead. Naeher played every minutes for the United States at the Tournament of Nations, including Thursday night’s win over Japan, before playing the full 90 Saturday night in Orlando. After a first half that was mostly controlled by the Pride, the Red Stars came out strong in the second half and evened the score in the 53rd minute. Sofia Huerta — back from training with the United States national team camp at the Tournament of the Nations, though not yet eligible to play for the U.S. — scored her fourth goal of the season to make it 1-1. 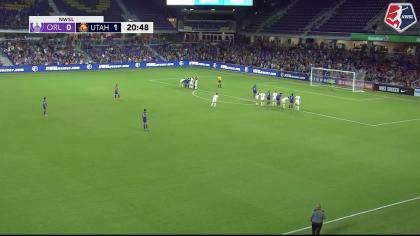 In the 53rd minute, Jen Hoy — starting at forward as the Red Stars were without Press — found Huerta at the top of the 18. Huerta took two touches before dialing it up on her left foot and bending a brilliant curling shot around her defender, well out of the reach of Pride goalkeeper Aubrey Bledsoe and into the upper left corner of the goal. The Red Stars stepped up the pressure a bit more after that, but were unable to find another goal. The Pride offense sprung back to life in the game’s final ten minutes — including the corner kick scramble in the 87th minute — but could not find their first ever win over the Red Stars. 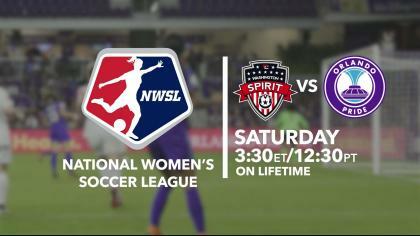 Match ends, Orlando Pride 1, Chicago Red Stars 1. Second Half ends, Orlando Pride 1, Chicago Red Stars 1. Substitution, Chicago Red Stars. Summer Green replaces Jennifer Hoy. Attempt blocked. Ali Krieger (Orlando Pride) left footed shot from outside the box is blocked. Attempt blocked. Alanna Kennedy (Orlando Pride) right footed shot from outside the box is blocked. Assisted by Jamia Fields. Alanna Kennedy (Orlando Pride) wins a free kick on the left wing. Substitution, Chicago Red Stars. Lauren Kaskie replaces Taylor Comeau. Attempt blocked. Ali Krieger (Orlando Pride) right footed shot from the centre of the box is blocked. Attempt blocked. Toni Pressley (Orlando Pride) left footed shot from the centre of the box is blocked. Attempt missed. Jamia Fields (Orlando Pride) left footed shot from the centre of the box misses to the right following a corner. Attempt saved. Marta (Orlando Pride) left footed shot from the left side of the box is saved in the bottom left corner. Delay in match Taylor Comeau (Chicago Red Stars) because of an injury. Substitution, Orlando Pride. Camila replaces Jasmyne Spencer. Attempt missed. Jennifer Hoy (Chicago Red Stars) right footed shot from outside the box is high and wide to the right. Assisted by Stephanie McCaffrey. Attempt saved. 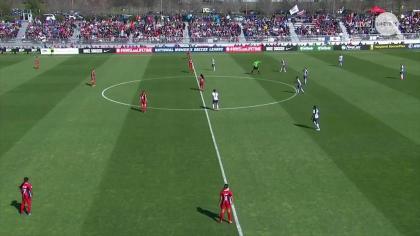 Sofia Huerta (Chicago Red Stars) right footed shot from the right side of the box is saved in the bottom right corner. Assisted by Vanessa Di Bernardo. Alanna Kennedy (Orlando Pride) is shown the yellow card for a bad foul. Delay in match Kristen Edmonds (Orlando Pride) because of an injury. Attempt saved. Stephanie McCaffrey (Chicago Red Stars) left footed shot from outside the box is saved in the centre of the goal. Assisted by Arin Gilliland. Substitution, Orlando Pride. Alanna Kennedy replaces Dani Weatherholt. Offside, Chicago Red Stars. Arin Gilliland tries a through ball, but Stephanie McCaffrey is caught offside. Corner, Chicago Red Stars. Conceded by Toni Pressley. Attempt missed. Stephanie McCaffrey (Chicago Red Stars) left footed shot from the left side of the box misses to the right. Assisted by Vanessa Di Bernardo. Goal! Orlando Pride 1, Chicago Red Stars 1. Sofia Huerta (Chicago Red Stars) left footed shot from outside the box to the top left corner. Assisted by Jennifer Hoy. Attempt missed. Stephanie McCaffrey (Chicago Red Stars) right footed shot from the right side of the box misses to the left. Assisted by Jennifer Hoy. Attempt blocked. Arin Gilliland (Chicago Red Stars) left footed shot from outside the box is blocked. Assisted by Jennifer Hoy. Second Half begins Orlando Pride 1, Chicago Red Stars 0. Substitution, Chicago Red Stars. Stephanie McCaffrey replaces Sarah Gorden. First Half ends, Orlando Pride 1, Chicago Red Stars 0. Attempt saved. Alex Morgan (Orlando Pride) left footed shot from outside the box is saved in the top left corner. Assisted by Marta. Jamia Fields (Orlando Pride) hits the right post with a right footed shot from the centre of the box. Assisted by Jasmyne Spencer. Attempt blocked. Toni Pressley (Orlando Pride) left footed shot from outside the box is blocked. Assisted by Jasmyne Spencer. Jamia Fields (Orlando Pride) wins a free kick on the right wing. Attempt missed. Jamia Fields (Orlando Pride) left footed shot from outside the box is just a bit too high. Assisted by Kristen Edmonds. Attempt missed. Vanessa Di Bernardo (Chicago Red Stars) right footed shot from outside the box is too high. Attempt missed. Alyssa Mautz (Chicago Red Stars) right footed shot from outside the box is too high. Assisted by Sofia Huerta. Corner, Chicago Red Stars. Conceded by Kristen Edmonds. Attempt missed. Sofia Huerta (Chicago Red Stars) left footed shot from the right side of the box misses to the left. Assisted by Alyssa Mautz. Goal! Orlando Pride 1, Chicago Red Stars 0. Alex Morgan (Orlando Pride) left footed shot from the left side of the box to the bottom right corner. Assisted by Jasmyne Spencer. Substitution, Orlando Pride. Marta replaces Rachel Hill because of an injury. Hand ball by Alex Morgan (Orlando Pride). Corner, Chicago Red Stars. Conceded by Jasmyne Spencer. Attempt blocked. Alyssa Mautz (Chicago Red Stars) right footed shot from the right side of the box is blocked. Assisted by Vanessa Di Bernardo. Delay in match Rachel Hill (Orlando Pride) because of an injury. Vanessa Di Bernardo (Chicago Red Stars) wins a free kick on the right wing. Corner, Chicago Red Stars. Conceded by Rachel Hill. Attempt blocked. Ali Krieger (Orlando Pride) right footed shot from the right side of the six yard box is blocked. Assisted by Chioma Ubogagu with a cross. Attempt missed. Alex Morgan (Orlando Pride) left footed shot from outside the box is high and wide to the left. Assisted by Kristen Edmonds. Alex Morgan (Orlando Pride) hits the bar with a header from very close range. Assisted by Chioma Ubogagu with a cross following a corner. Jamia Fields (Orlando Pride) wins a free kick in the defensive half. Attempt saved. Jasmyne Spencer (Orlando Pride) left footed shot from the left side of the box is saved in the bottom left corner. Assisted by Alex Morgan. Offside, Chicago Red Stars. Jennifer Hoy tries a through ball, but Arin Gilliland is caught offside.